CityWatcher.com, a private video surveillance company has embedded silicon RFID chips in two of its employees. This is the first instance in which workers in the United States have been chipped as a way of identifying them. The company is testing the VeriChip ID tags as a way of controlling access to physical locations: in the case of CityWatch.com, a room that holds security video footage for government agencies. Sean Darks, Chief executive of CityWatcher, stated his belief that the chips, which are encased in a special glass to make them human-implantable, are really no different than any other identity cards. Placed in the upper right arm, they are scanned by a device which is essentially the same as an RFID card reader. The basic technology is more than thirty years old; it has been used for almost a generation as a way of providing a permanent ID for animals, including farm animals and pets. It is in wider use for people in other countries. 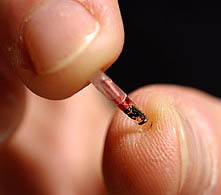 More than 2,000 nightclub patrons in Barcelona, Spain and Rotterdam, Netherlands have been chipped, using the implanted RFID tags to order with the wave of a hand. If you'd like to get one (just to be on the cutting edge) doctors tyically charge a $200 fee for implantation, a relatively simple procedure involving a needle slightly larger than the diameter of the device itself. Science fiction writers have been working with this idea for a while. In his 1984 book Neuromancer, William Gibson wrote about executives who had special chips implanted not only for identiification, but other purposes as well.